Just 3 1/2 miles north of Harbor Springs, between Lower Shore Drive and Lake Michigan, is the 30-acre wildlife sanctuary known as Thorne Swift Nature Preserve. Protected in this natural refuge lie cedar swamps, hardwood forests, shifting dunes, a nature center, and a sandy beach. All are accessible to the public and well-maintained, thanks to a unique cooperative effort between the Little Traverse Conservancy (LTC) and West Traverse Township. The tour begins at the Elizabeth Kennedy Nature Center, filled with displays and information about the plant and animal life found just outside its walls. The "Specimen of the Day" and hands-on nature activities entertain school children who come by the thousands in the spring and fall. May through September, a naturalist answers questions here or guides visitors along with well-marked trails leading out from the Center. Three trails begin and end at the Center--the Cedar, Balsam, and Beach Trail--each for the most part, wheelchair accessible. On the Cedar Trail, a boardwalk path overlooks dense cedar swamps teeming with birds, deer and other wetlands inhabitant. This includes bugs so bring insect repellent. Stop for a moment and listen to the rich medley of bird calls. The Balsam Trail, also one-half mile long, winds through white and yellow birch stands into woodland wildflower "gardens." One of Northern Michigan's most beautiful wildflowers, the showy Lady's Slipper grows here, nurtured on a fungus which occurs in very few areas. Just off of the Balsam Trail is a walkway leading to the Dune Observation Deck, high above a restricted dune area. From this vantage point, quiet watchers may see waterfowl, nesting gulls, chickadees, warblers and larger wildlife. At twilight, owls and nighthawks swoop down from the treetops over the platform. Sunsets from this spot are glorious. The Beach Trail leads from the Nature Center one-quarter mile down to 300-feet of sparkling beach. Swimmers and picnickers enjoy this secluded shoreline. Restrooms are available. Throughout July and August, Thorne Swift naturalists schedule nature hikes on such topics as wild edibles, dune shrubs, medicinal plants and wildflowers. Classes on nature crafts for children and adults fill quickly. Included in each season's program is the ever-popular Night Walk, providing a chance to gaze at distant constellations and nearby nocturnal neighbors. 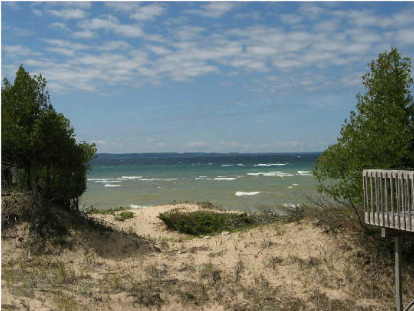 Be sure to visit this lovingly preserved natural refuge on Lake Michigan. Thorne Swift is open Memorial Day through Labor Day from 10am to sunset. Parking fee is $5 for non-residents of West Traverse Township.